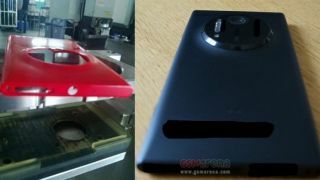 A flood of new leaked photos of the Nokia EOS "Elvis" with PureView camera technology hit the web this week, showing off the device's massive camera hump. The EOS is believed to pack a 41-megapixel camera into a polycarbonate frame similar to those used on Nokia's Lumia phones. A Nokia EOS report earlier this week claimed that the alleged Windows Phone 8 phone will sport an enlarged bump on the back where the camera goes, and these photos certainly corroborate that. They're not the first photos to leak, either, and despite the EOS still being unofficial we're beginning to get a decent picture of the device. Today's images came from WPXAP.com, GSMArena and a Twitter account called Vizileaks, while photos leaked yesterday originated at WPDang.com. Collectively they show the Nokia EOS "Elvis" in black, yellow and red, matching Nokia's signature colorful aesthetic. Other than that it looks essentially like a Lumia 920 combined with Nokia's Symbian-powered 808 PureView, but with a perhaps even larger camera. GSMArena also reported that the Nokia EOS is 9.77mm thick, matching perfectly with a report from earlier this week that claimed the EOS was a 1mm thinner than the 10.77mm Lumia 920. Other rumored specs include a quad-core processor, 32GB of storage, a 720p OLED display, FM radio, Xenon flash, and the Nokia Pro Camera app. The most recent leak this week predicted that the handset will go on sale on July 9 on AT&T in the U.S.
Can't wait for the Nokia EOS? Check out TechRadar's list of the best camera phones available now.